Antiquities minister Mamdouh El-Damaty embarked on Thursday on an inspection tour around the different archaeological sites and monuments in the upper Egyptian city of Beni Suef escorted by the city’s governor Magdi El-Batiti and Youssef Khalifa, head of the ancient Egyptian section. The area of Meidum Pyramid was the first site to be visited. During the tour, El-Damaty announced that a comprehensive restoration project is to begin immediately to make the site more tourist friendly. The development project will include the establishment of a sound and light show on the ancient history of Beni Suef and the construction work of Meidum pyramid. A new lighting system powered by solar energy is to be installed as well as a visitor’s centre equipped with a cinema, bookstore, gift shops and cafeteria. El-Damaty also gave the go ahead for the ministry’s excavation works at Ehnasia site to conduct further exploration in addition to the restoration project that is already underway. The site is to be developed into an open-air museum. The Meidum pyramid consists of large mud-break mastabas which were originally built for the last third dynasty king Huni. Construction continued during the reign of his successor King Senefru. The architect who continued Meidum construction was the successor to well-known ancient Egyptian architect Imotep, who built the Djoser step pyramid. 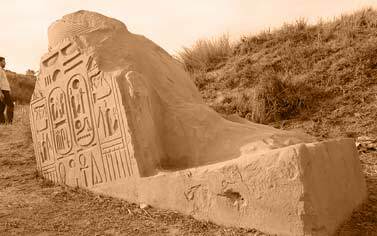 However, the modification made Imotep’s design and attempts to extend the structure led to its partial collapse. 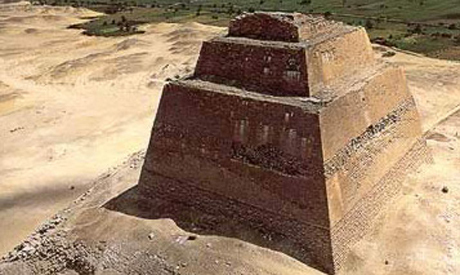 “The unusual appearance of Meidum pyramid led to Beni Suef inhabitants calling it Al-Haram Al-Kadam (Pseudo Pyramid),” Khalifa told Ahram Online. Khalifa added that the Meidum pyramid originally consisted of several mastabas connected to each other to give it the pyramid shape, the ancient Egyptians filled the gaps between every mastaba with limestone casing.